This is a serious film. In fact, most films set in Medieval time or in any Swashbuckling setting are often serious, except for the usual THREE MUSKETEERS type of stories, which are always 'Rocambolesque.' Canadian-born actor Stephen Forsyth's only PEPLUM film. He made a handful of movies, including Mario Bava's HATCHET FOR THE HONEYMOON (his last), before retiring from movies. It's a shame he didn't continue on since he had some good screen presence. I guess acting wasn't his thing. 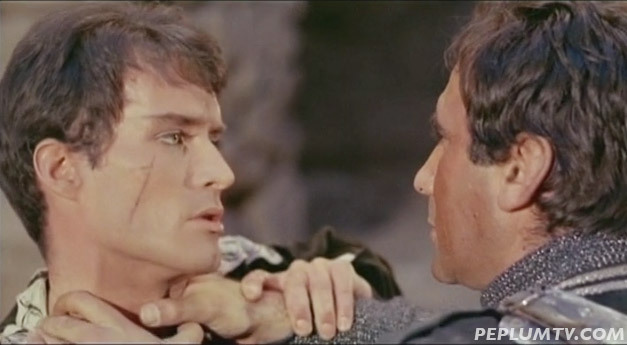 As for Alberto, he was a regular actor of the PEPLUM genre. Always excellent and dependable. The story was written by Riccardo Freda but the film itself was directed by José Luis Monter.